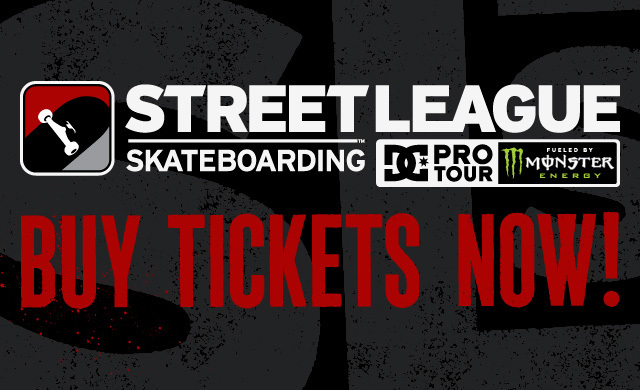 Los Angeles, Calif. (April 1, 2011) - Street League Skateboarding™, the premier professional street skateboarding series worldwide, has announced the tickets for the 2011 Street League DC Pro Tour Fueled by Monster Energy will go on sale today, Friday, April 1st. The second season of the tour include stops in Seattle, WA, Kansas City, MO, Glendale, AZ and will end with the Championship event in Newark, NJ. Each stop of the tour will be broadcasted live on ESPN and ESPN2 with an international webcast. Street League Skateboarding is the premier professional skateboarding contest series worldwide. 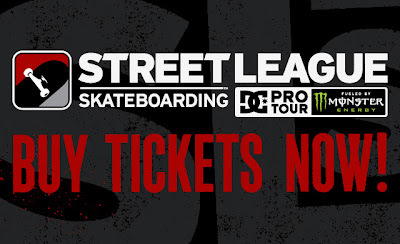 Founded by 20-year professional skateboarder and entrepreneur, Rob Dyrdek, Street League features 24 of the world’s top street skateboarders competing exclusively for a groundbreaking $1.6 million prize purse in a nationwide tour live on ESPN/ESPN2. Utilizing the ISX™ instant-scoring format Street League is the only contest where a fortune can be won or lost on a single trick.